Ellesmere District got involved in Keep Britain Tidy's Clean For the Queen campaign. 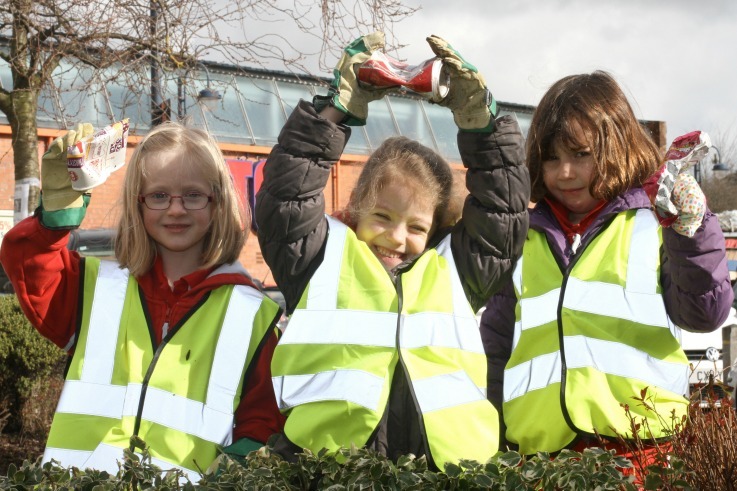 An enthusiastic group of Girlguiding members from Ellesmere spent 90 minutes litter picking and washing road signs around Ellesmere as part of Keep Britain Tidy’s “Clean for The Queen” on Saturday 5 th March. 55 people Rainbows, Brownies, Guides, Young Leaders, Duke of Edinburgh’s Award participants, Rangers, Adult leaders and parents spread across the town cleaning up. Three large trolley loads of rubbish together with a mountain of black bags were accumulated in just 90 mins. Fran Butler Guider said ‘ We can all go out litter collecting and tidy up our communities’. Guiding has produced a badge to celebrate the Queen’s 90th birthday and we wanted our members in Ellesmere to uphold the Guiding part of the promise ‘to serve the Queen and my community’. The Clean for the Queen campaign gave members just the opportunity for a challenge. It was amazing the amount and types of litter that was gathered. All who took part will be awarded the Queens’s 90 year Birthday badge.